The durable Advantage 20.5 in. fossil church chairs are a great solution for church seating comfort. Each church chair features a 4 in. padded, 2 lb. density, 100% virgin, polyurethane foam seat with no fillers, a cut-away back to accentuated lumbar support, integrated ganging device for connecting chairs together in rows, plastic feet caps to protect floor surfaces and a 16 gauge, textured black powder coated steel frame. 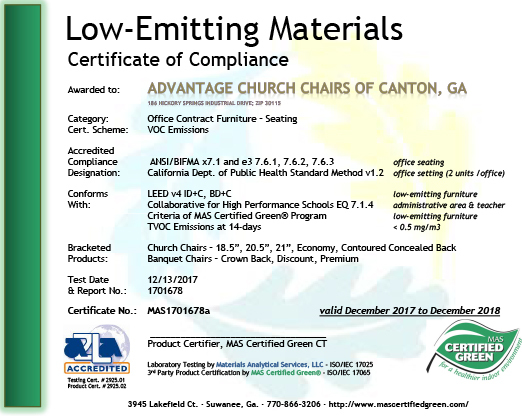 These church chairs are shipped fully assembled using a durable plywood base for the seat and back which is attached using T-NUT construction creating a metal on metal connection that's more durable than traditional wood screws. The foam and fabric of each church chair meets fire retardant specification CA117 and the fabric can withstand up to 200,000 double rubs (Wyzenbeek test). Each chair is also load tested up to 1,000 lbs. of static weight and includes a 10 year normal use warranty on foam and fabric with a lifetime warranty on frame failure due to broken welds. Make a smart decision and exceed the expectations of church goers with these exceptionally built church chairs.